Originally posted on the website Boxer Rescue of Atlantic Canada home page - December 2008. Reposted with permission. This is Brosa. His name means 'smile' in Icelandic. The reason he was named this is because he's going to have a special look about him as he grows up. You see, Brosa was born with both a hare lip and a cleft palate. This prevented Brosa from being able to nurse from his mom. He could not feed with his litter mates and was destined to starve to death. 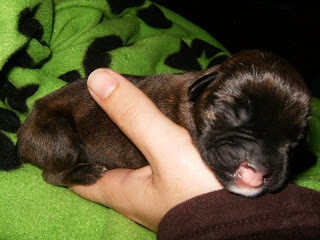 At 4 days old this little nameless puppy made out to survive a 7 hour drive to his new foster home. We had no idea how delicate he would be until we saw him that day. He really touched our volunteers. Time was spent hand feeding him with a dropper during his long road trip. It was a terribly stressful time for everyone. So, at 4 days old, Brosa was able to be settled in his foster home. Thanks to Charlotte for sharing the drive and caring for this precious passenger during her leg of his journey. We're going to be completely honest and admit that Brosa's first few days were tough. Brosa was so small - he was the runt of the litter and he wasn't even 1/2 of the size he should have been at that age. His foster mom didn't think he was going to make it, despite the feedings every 2 hours, around the clock. This dehydrated, weak little puppy deserved a chance though. He couldn't nurse, he was getting so little nutrition, even supplementing with a dropper wasn't enough - he was dying. However, his foster mom wasn't going to give up. She started to tube feed him. Slowly things began to look up. Brosa was given a name and round the clock care. All of this seems to have paid off because Brosa has been making improvements. He's getting the best of nutrition and supplements and his foster mom has devoted herself completely to his care, feeding him every 2 hours and trying to nap in between. We hope Brosa can make it and think he has a really good chance. We think this little fighter has already defied the odds by making it this far. At the time of posting, Brosa seems to be doing well! This is miraculous in itself. But for Brosa to have a chance at life he needs to keep going. He's already fought so much and overcame the odds. But, we need help. Brosa's formula is a large expense. Before he is able to be transitioned to any type of solid or semi-solid food his formula will cost $40/week. He will also need a full work up to ensure that all of his organs and systems are developing properly. Following this we hope that Brosa will be deemed fit to have surgery to reconstruct his palate and help him to live a semi-normal life. With this surgery Brosa will be able to eat like a normal dog and reduce his risks of lifelong infections. We know he's got the spirit but he needs the physical likeness to help him succeed. Of course this is quite a bit outside of what BRAC is prepared for and able to handle at the moment. So, we're putting a plea out in hopes that anyone able will assist us in helping Brosa to get what he needs. So, if you can help at all, please do. This little guy deserves it. he's a fighter but he needs a push. No amount is too small - every little bit will help. You may donate via paypal using the link below or you can email transfer to info@boxerrescueatlanticcanada.com . Please put Brosa's name in the message field.